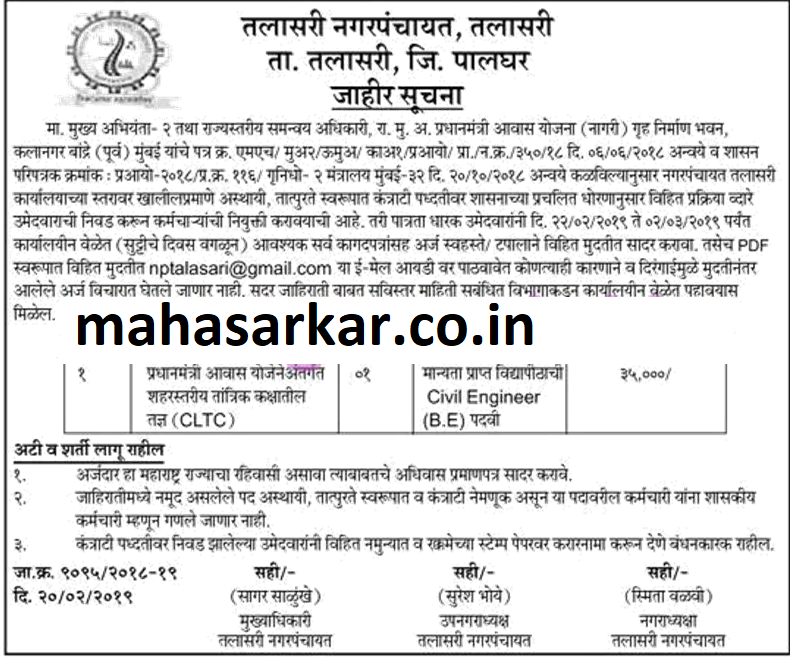 Talasari Nagar Panchayat (Talasari Nagar Panchayat Palghar), Palghar published a new job notification for Technical Experts Post. The recruitment is for total 01 Vacancy. The willing candidates are informed to see the latest notification February 2019. Qualification required Civil Engineering (B.E) and More. Last Date of offline application is 02-03-2019. For More details of Talasari Nagar Panchayat Recruitment 2019 Read Below. Education Qualification: Civil Engineering (B.E) and More. For Post wise Education Details follow the detailed advertisement. Interested & Eligible candidates can send their application along with all the necessary documents and testimonials to nptalasari@gmail.com / तलासरी नगर पंचायत, तलासरी. Application starts offline/Online 23-02-2019. Last Date of application is 02-03-2019.